WHAT I SMELL: Flowerhead opens with a sweet and spicy zesty lemon which is soon followed by this wonderful Lingonberry, which is pure jelly happiness as its not thick and jam like. Instead, it’s oh so uplifting, lilting and buoyant. After a few more minutes, the Lingonberry dissipates and the fragrance begins to become more full-bodied and radiant. The florals are rich and enrapturing without being too heavy and heady. After around the 10 minute mark the jasmine takes center stage with a peppered edge. Thankfully, the tuberose plays 2nd fiddle which keeps the whole structure lighter, although there is a spice that seems to fleck around the edges along with the greenish base. And just when I thought the fragrance had settled in, after around 30 minutes Flowerhead starts throwing out big flowered balls as it begins to really project as if the tuberose is yelling that it wants to be seen! A couple of spritzes and no one will miss the fact that you’re wearing this beauty. 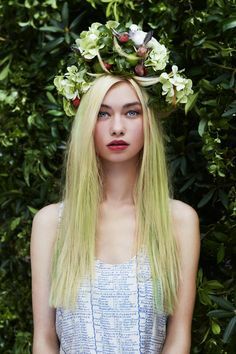 As far as I’m concerned, Flowerhead can wrap itself around my whole body!! WHAT IT SMELLS LIKE TO ME: Who can fight with the perfect visual…Flowerhead! BOTTOM LINE: Flowerhead is a big full bottle “yes” for me. Every time I put this on, I crave more. This is perfect for summer…and really all year long. My sample is almost gone…I need more!!! 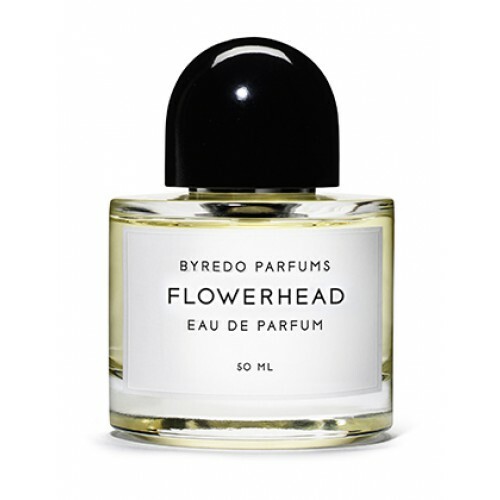 Categories: Byredo | Tags: 4 bones, Byredo, EDP, floral, Flowerhead, fragrance, parfum, Perfume, review | Permalink. I love your review 🙂 I have read a number of reviews of Flowerhead (which I have not tried), but the sound of “peppered jasmine” is very tempting. Also, your words conjure up an image in my mind of a spirited four year old little girl with a big basket of flowers, which she is crumpling up and throwing and people (while yelling perhaps, too?). So I had to smile 🙂 Thanks! I’ll have to try this sometime soon. Thanks for the kind words Nemo. Actually you’re imagery of a little girl with a basket of flowers fits well. This is an energizing floral and a happy one…but don’t get me wrong… it’s sophisticated, thus one of my adjectives is “chic”. If you like white florals…this is for you 🙂 Thanks for stopping by! I think this is one of the best white floral launches in years. It’s a huge ‘ole tuberose but it has that fruity tartness and greens that makes it stand out. Victoria, it’s your review that made this a must test…and I really love it… enough to have purchased a bottle for myself. Now, if it could only get here quicker! I really love this fragrance and I’m so glad you liked it as well. 🙂 It’s nothing like one of those “over sweet, sick to stomach” fruity florals overflowing the market. As you said, it’s happy and sophisticated as well as beautiful and so positive. This is a big yes for me too. You hit the right on the head…it really is a beauty! I have read a number of wildly differing reviews of Flowerhead, so there is nothing for it but to give it a go and see for myself, encouraged by your positive take on it. I am certainly partial to ‘peppered jasmine’, and particularly like it in Korres Pepper, Jasmine & Gaiac Wood. Do you know that one? I do not know that…but I find that I have a tendency to stay away fro Gaiac Wood as I find it typically too overpowering and it seems to be a bit too sweet for my taste. Let me know if you have a chance to check this out! Really enjoyed your take on this, which is exactly what I thought people would feel about this, if they were not hampered by being a little too sensitive to tuberose (like me). It’s just so happy! I’m like you Nat. Tuberose can overpower me and this does it just right! Thanks for the link! Glad you’re also a fan. It’s indeed happy, but not cloying. Annie – I have to admit that I have already consumed 1/2 of the bottle in the last month. I love it!